Three men in south-western China accused of selling 35kg (77lb) of meat from a panda they killed are to be prosecuted, a court has announced. Two brothers and another man are also said to have sold the animal's feet and eaten some of the meat themselves. Police discovered the panda's skin and 10kg of meat in a raid last December. Panda poaching is extremely rare in China where the endangered animals are seen as a national treasure. The case has caused revulsion on Chinese social media. The brothers, Wang Wenlin and Wang Wencai, are accused by police of shooting the panda dead in Zhaotong in southern Yunnan province. They are said to have sold the meat and the feet for about $750 (£492) to another man, Li Kequan, who then resold it to six more people. 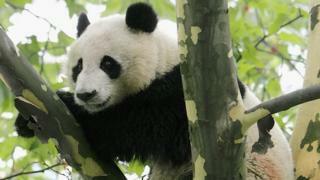 DNA tests on the meat and skin seized by the police confirmed it was from an adult female panda. The China Daily newspaper published a photo of the animal's pelt and said parts of its skull and gall bladder were also found. A Yunnan court says the investigation into the three men has concluded and they have been remanded for prosecution. There are fewer than 2,000 pandas in the wild in China. The International Union for the Conservation of Nature lists giant pandas as endangered, but their numbers have almost doubled since the late 1970s. Hunting pandas can lead to a 10-year sentence - or, in what the Chinese government calls "grave circumstances", life imprisonment or even a death sentence can be applied.